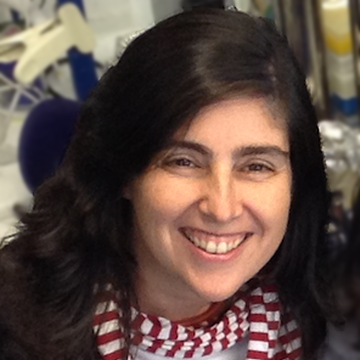 Rita Sobral is Head of the Laboratory of Molecular Microbiology of Bacterial Pathogens at UCIBIO@REQUIMTE, composed of one post-doc fellow, three PhD students and three Master students. Research carried on in the Lab MolMicro of Bacterial Pathogens focusses on the molecular mechanisms of antibiotic resistance in Staphylococcus aureus, in particular the role of the bacterial cell wall and the physiology of the peptidoglycan polymer. Our group has identified the MurT-GatD enzymatic complex responsible for the amidation of peptidoglycan in S. aureus, an essential modification for cell viability, antibiotic resistance and interaction with the host. Our research lines have explored the influence of this modification in the resistance mechanism of distinct S. aureus clonal lineages, the establishment of the MurT-GatD interaction and also its role in the synthesis and degradation of peptidoglycan. We propose that this enzymatic step is a promising target for new antimicrobial strategies and we aim to clarify its role in the host immune response. Through collaborations we are also exploring the structure of the complex. Other interests of the group include the study of the mechanisms of biofilm formation, bacterial cell autolysis and the interaction of the cell wall with the host environment and with other microbial species. Molecular techniques used in our lab include construction of specific mutants, biochemical analysis of the cell wall, protein-protein and protein-DNA interaction assays, transcriptomic and genomic analysis and antimicrobial and anti-biofilm resistance assessment. Maugeri G., I. Lychko, R.G. Sobral, A.C. Roque.Identification and antibiotic-susceptibility profiling of infectious bacterial agents: a review of current and future trends. Biotechnology Journal. 2018. e1700750. Leisico F., D. Vieira, T.A. Figueiredo, M. Silva, E.J. Cabrita, R.G. Sobral, A.M. Ludovice, J. Trincão, M.J. Romão, H. de Lencastre and T. Santos-Silva. First insights of peptidoglycan amidation in Gram-positive bacteria - the high-resolution crystal structure of Staphylococcus aureus glutamine amidotransferase GatD. Scientific Reports. 2018. https://doi.org/10.1038/s41598-018-22986-3. Rolo, J., P. Worning, J. B. Nielsen, R. G. Sobral, R. Bowden, O. Bouchami, P. Damborg, L. Guardabassi, V. Perreten, H. Westh, A. Tomasz, H. de Lencastre, M. Miragaia. 2017. Evidence for the evolutionary steps leading to mecA-mediated ß-lactam resistance in Staphylococci. PLOS Genetics. https://doi.org/10.1371/journal.pgen.1006674. R. Portela, P. Patrício, P. L. Almeida, R. G. Sobral,J. M. Franco, and C. R. Leal. 2016. Rotational tumbling of Escherichia coli aggregates under shear. Phys. Rev. E. 94, 062402.10.1103/PhysRevE.94.062402. Siopa F., T.A. Almeida, R.F.M. Frade, I. Neto, A. Meirinhos, C.P. Reis, R.G. Sobral, C.A.M. Afonso, and P. Rijo. 2016. Choline-Based Ionic Liquids: Improvement of Antimicrobial Activity. ChemistrySelect. 1, 5909-5916.DOI: 10.1002/slct.201600864. Figueiredo, T.F., A.M. Ludovice and R.G. Sobral. 2014. Contribution of Peptidoglycan Amidation to Beta-Lactam and Lysozyme Resistance in Different Genetic Lineages of Staphylococcus aureus. Microb. Drug. Resist. 20(3). doi:10.1089/mdr.2014.0042.